Description: Lil' Daddy 7" wood jerk bait, has the same unbreakable Lexan lip and great wiggle but is less buoyant so it goes deeper and stays in front of a fish's face even longer! Just like the Big Daddy, Musky Mayhem's Lil' Daddy has an adjustable back tail you can experiment with and alter the action of the bait. 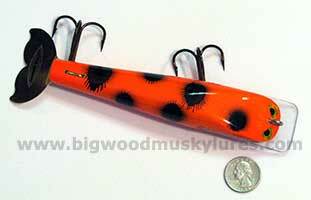 Try working this jerkbait slow to trigger strikes from inactive or pressured Muskies. An awesome choice for those who troll with jerkbaits! 7", 2 oz.